Questions asked in the topic will be re-written up here, as well as the answers (and if you want credit for your question/answer that much, then feel free to say so XD). Also, please do correct/add to incorrect or incomplete answers! The more information, the better. How can I unlock Ryuuguu Komachi clothes and Ritsuko? Answer the questions asked by Ritsuko in week 8 and week 30 correctly to unlock Ritsuko in S4U. You can only get Palace of Dragon (the Ryuuguu Komachi outfit) after inviting Ritsuko to a Quintet Live and completing the game. How many clothes shops are there, and how do you unlock those shops? 2 shops (LUCKY RABBIT and BK MANIAC). LUCKY RABBIT is available from the start. BK MANIAC is unlocked after you spend a certain amount at LUCKY RABBIT. When does LUCKY RABBIT have sales? Weeks 11~13, 22~24, 33~35, and 42~44. Is there any way to tell when BK MANIAC will have a sale/when BK will be out of the store? Do I have to do Iori's "vending machine" tutorial every time I play the game? No. You can select the right (red) option to refuse Iori-hime's demands, and proceed with the day as usual. Is there any reason to continue a lesson if it's perfect + bonus? What's the difference from perfect, and what does bonus add? There doesn't seem to be a reason to continue doing the lesson after the bar is maxed out ("bonus" being the confirmation that the bar is as full as it'll get). What's the difference between a Super Lesson and a Lesson (besides the cost)? A Super Lesson (ちょーレッスン) lasts for a longer time, making it easier to get a perfect lesson. Also (according to the manual) it gives a better stat-boost than a normal lesson. Is there a list of all the reporters and what they influence somewhere? I'm really confused about what I'm supposed to do to "win" the game. Are there specific events I'm supposed to pass? / How do I get each ending? Bad Ending: No awards won. Normal Ending: Win other awards, but no Grand Prix award. Good Ending: Win the Grand Prix award. True Ending: Win all awards. How can I gain the Grand Prix award from the Idol Academy? Have at least one song in the top 10 on the charts, and have 300,000 fans. How can I gain other awards from the Idol Academy? Win 100,000 fans in every area (except Tokyo) and then win the 歌姫・歌王子 Festival that appears. Why are my idols ditching work / how do I get them to stop? If you use the auto-commands too often, your idols will become fatigued and take a week off on their own accord. Just stop using auto-commands so often (save them for when you actually need them). Is there a way to edit the idols' singing in S4U mode similar to L4U? How do I unlock Palace of Dragon (Ryuuguu Komachi outfit)? Beat the game with an ex-Project Fairy member (Miki, Hibiki, or Takane) as leader. How do I get the things from the Xbox360's Catalogs 01-03? If it isn't on the list, it's available from the get-go. How do I unlock Nanairo Botan, Princess Melody, and associated accessories? Princess Melody (Extend): Complete the Extra Episode with all characters (Iori, Ami, Azusa, Ritsuko). Otohime Extensions: Perfectly complete the Extra Episode with Ritsuko. Seven-color Bracelet: Perfectly complete the Extra Episode with Iori. Emblem of Dragon: Perfectly complete the Extra Episode with Azusa. Ryuuguu Friends: Perfectly complete the Extra Episode with Ami. Complete the game with all of the ex-Project Fairy members (Miki, Hibiki, and Takane) as leaders. What does the Ryuuguu no Tsukai amulet do? A BIG thanks to BT2 for pretty much all of the info about the PS3 version! you have we will say 30 entrants. it will say top 3 win. you all compete for total top score. not stars like before, just 1 total score. color worth changes with every press - it is like if in idolmaster 1 judge interest modified points given. so, if you push visual a lot, visual bonus will drop to x0.01, so it is worth no points. You can use A to use heart from communications to increase voltage. While you are pushing correct timing, you also get Voltage. Voltage builds up and when it gets full, you can Burst Appeal. but you get much more. 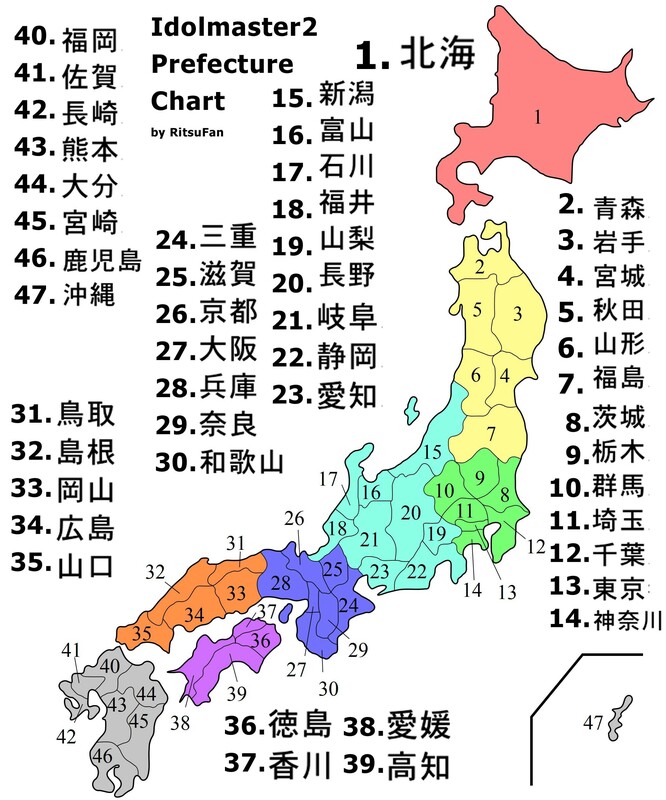 Promotions: You have to pick the prefecture the promotion is in. This can be scary, but when they pop up the picture of the prefecture, you can pause the game if it is before the choice pop up.The pause block may cover the prefecture, but you can unpause and repause quickly to get a glimpse. Also remember where about on the main map your promotion was to narrow it down. After that it is just like Idolmaster 1. Wow, thanks for all the information and the map! I hope to be a help to everyone who plays Idolmaster. I will have much more as I see a need for it in the game. I would do communication, but that is much work, and Icomu will probably already do it. THANK YOU so much RitsuFan!! You've turned me into a RitsuFan fan!!! Also helpful, is the main options screen. It is on the main main page, where you can go produce, s4u, shop, and so on. It let's you pick what default clothes they wear and if you skip things, but very important is the far right choice. It let's you time your button presses so wireless delay can be removed, also like inRock Band. Very helpful for vocal parts. This can be hard if you do not understand kotori hints. Can someone translate overview of p40-41 in the manual? That information is needed for Idol Academy. Especially Break and Revial. I do not have the time to do it. But, it is more imporant than rest of manual. Thank you for working with ne to bring Imas to everyone. the bottom of 41 is the most important. Middle and bottom. The Keep, Break and Revival sales strategies are a must if you want to top the charts, due to 2's album sales system. Keep: Just simply enter Live with your latest song. The sales won't drop for a while. Break: Where you revive the popularity of your latest song which has been released for over 10 weeks. Enter a Fes with it and win. Revival: Where you revive the popularity a song other than your latest one, which has been released for over 10 weeks. Enter an Audition with it and win. Also, a few tips for competing in Audition, Fes and Lives. Don't try to create a rounded unit. It works, but the better way seems to specialize in two areas and dump the third. When you Burst Appeal, switch to an idol who shares her Burst type with the highest Appeal Multiplier. Thank you very much! This reads very well. Can you also enter what is required to make it to the IA? I believe there is info on p43 for it as well. I am sorry for requesting other translators, but you can make it english very well, and I do not want to reverse words like "this" is more than "that", those are easy to reverse and change the idea very much. All of that section is actually so helpful, but most is obvious, like the big chart. However, the last part is rare, so is it important? I'll look into it. I've actually been working on a full translation of pages 40/41 (it took a while because I had to download something on my Mac to open rar files, and then when I read it I couldn't understand the difference between Break and Revival initially). After I'm done with that I'll look into doing something about Pg 42 (Pg 43 is on Hell Training). Kotori: "Your CD sales number for the week is affected by a number of factors, namely: Saleability (literal: spending power [of your accumulated fans]), High Score, Sales Bonus, and Sales Coefficient/Multiplier (I'll stick with Coefficient from here on out)." Calculated by multiplying the Number of Fans (for each area) with the Awareness level (of the corresponding area). In short, [Number of Fans X Awareness]. As NoF and Awareness grows, so does your Saleability factor, leading to higher CD sales. Basically your high score for a specific song during any stage performance (Auditions, Lives, Fes, etc). To get a better high score, work on lessons, do well in stage performances, etc. **Affects only the song you are currently producing. Depending on the number of CD singles your idol unit has previously released, this factor changes. For instance, if your currently produced CD single is your unit's 1st, obviously your unit's a newcomer and not a lot of people have heard of you - so Sales Bonus is low. From your 2nd onwards, however, because your idol unit's been around the scene for a while, Sales Bonus increases progressively. Changes depending on how many weeks it's been since your currently produced CD single has been released. Fundamentally, Sales Coefficient (and thus, sales) is high in the first week of a new CD single release. However, Sales Coefficient decreases with each subsequent week. Kotori: "To sum it up, basically the highest sales number possible is achieved during the week your 5th CD single is released (5 is the maximum you can release in the game). "That said, even if you're still on your 1st CD single release and your idol unit's fame is low, you can still work on your Saleability and High Score factors. Don't give up and aim on achieving better sales! Especially since the fruits of your labour may carry over to the next CD single release and affect its sales figures, so plan your unit's activities accordingly and aim for the best! Kotori: "Normally, your CD single sales will lower as the weeks go by, until about 5 weeks after its initial release when sales will almost completely stop. However, if you manage to achieve a "Keep" status for a certain week, you can extend the number of weeks your CD single will continue selling, and achieve an overall increase in sales!" -Your currently produced single is your latest release (this means you CANNOT select an old song to perform during Auditions, Live, and Fes unless it is an encore or a special quintet performance. Selecting an old song in those situations will set your currently produced single to that old song). -Achieve success in a Live during the week you want to achieve a "Keep". Kotori: "When sales for a particular CD single has completely come to a halt, the usual strategy is to announce and release your next CD single. However, there are means with which you can try and aim for the same old CD single to continue selling - like with a "Break" or a "Revival". These will occur as long as the following conditions are met." -It's been at least 10 weeks since this CD single has been released. -This CD single is your latest release. -Successfully beat your rival in a Fes during the week you want to attempt a "Break". -Finally, this will only happen if the song is not already in a special status (Revival, etc) in the Dotop CD rankings. -This CD single is NOT your latest release. -Successfully pass an Audition in the week you're attempting a "Revival". -Finally, this will only happen if the song is not already in a special status (Break, etc) in the Dotop CD rankings. "Your currently produced single is your latest release." It's confusing to me because I don't know if there are cases where your currently produced single is NOT your latest release. Does anyone know what this criterion is referring to? It's the one that says "genzai produce chuu no rakkyoku de aru". I think this may be releated to the way new CD singles are announced and released in iMAS2, which is completely different from the first game. *There may also be other circumstances during which you may not announce a new single release. I'm going to list the details for each individual activity according to the order given by the table from left to right. It may not be the most intuitive order, but if you just refer to one or two things listed below you should pretty much be able to figure out the entire table yourself. -Increases the corresponding parameter stat by a medium amount. -Increases the corresponding parameter by a large amount. -Increases number of fans by a large amount. -Raises awareness level by a medium amount. -Earns a large amount of money. -Chance of achieving "Revival" status. -Increases number of fans by a small amount. -Raises awareness level by a large amount. -Earns a small amount of money. -Increases number of fans by a medium amount. -Chance of achieving "Keep" status. -Earns a medium amount of money. -Raises awareness level by a small amount. -Chance of achieving "Break" status. -Gains a large deal of memories (for memory appeals). Kotori: "Do note that separate instances of the same activity category (note: such as Auditions) can differ in terms as type, effects, and difficulty level."